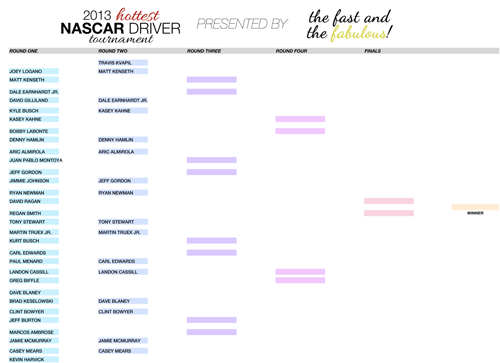 The first round of the 2013 Hottest NASCAR Driver Tournament has ended and now we have the results! This is shaping up to be a very interesting tourney, I have a feeling that each round is going to be hotly contested. Here are the match-ups for the second round! UPDATE: Round 2 voting has ENDED. Find out who made it Round 3!